American Communications Construction understands the importance of leaving a small footprint. The Houston-based company installs more than 10,000 feet of distribution and trunk cables for Comcast every week in residential areas throughout Houston. “These homeowners have spent a considerable amount of money to landscape their yards, and our job is to install the cable while minimizing disruption to their landscapes,” says Aven McBride, president of American Communications Construction. McBride founded American Communications Construction in 2001 in order to have his own say in how the company was structured and operated. He previously spent more than 20 years in the cable television industry. Today, American Communications Construction specializes in fiber optic placement, cable splicing and fiber optic and cable testing. The company also helps customers to design new plant infrastructures. American Communication Construction works for a number of cable providers in the Houston area, including Comcast. McBride’s company is responsible for the repair of distribution and truck cable lines that have gone bad or have been damaged by contractors. The Houston area uses a rear easement in the residential areas to place all utility lines, which means that these lines are basically in the backyards of homes throughout the city. “If we went into these easements with a trencher and opened a trench from fence to fence in the backyards, obviously we would cut a number of service drops or service cables and destroy the homeowners’ landscaping, which would create some issues,” says McBride. When McBride started his company, he decided to use HammerHead® piercing tools to replace the cable lines. Jack Parker oversees operations for the company and likes the piercing tools because they’re fast. According to Parker, once a work order is received from Comcast, American Communications Construction contacts One Call to locate the existing utilities at the property. This can also be the biggest challenge for his crews. Despite all of the changes, homeowners receive notification that work will be completed 24 to 48 hours in advance. American Communication Construction crews leave a door hanger at each affected residence, letting them know why and when work is being done. This gives the homeowner time to move pets out of their yard or unlock gates. Parker notes that there are work orders from Comcast that are rush jobs which require a line to be replaced right away. These cases require enhanced communication with One Call and the homeowners. Since most of the yards American Communications Construction works in are landscaped, the crews take extra care to minimize damage to the lawn and landscape and the HammerHead piercing tools are ideal for this purpose. 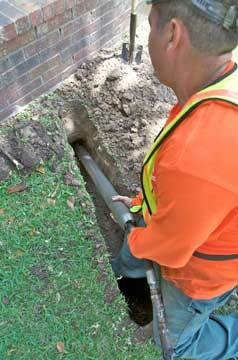 The crew will hand-dig the pits, which are 30 inches deep and 10 inches wide on average, to maintain the minimum 24 inches of cover required in the Houston area. The ground conditions consist mainly of clay and sandy clay soils. Sod is removed and placed out of the way. In some cases, the crew will even place the dirt from the pits on plastic to protect the lawn. Once the entry and exit pits are completed, the crew positions the 3-inch HammerHead piercing tool and begins the piercing process. Most shots range from 40 to 50 feet. Some have been as long as 150 feet, depending on the layout of the homeowner’s yard. 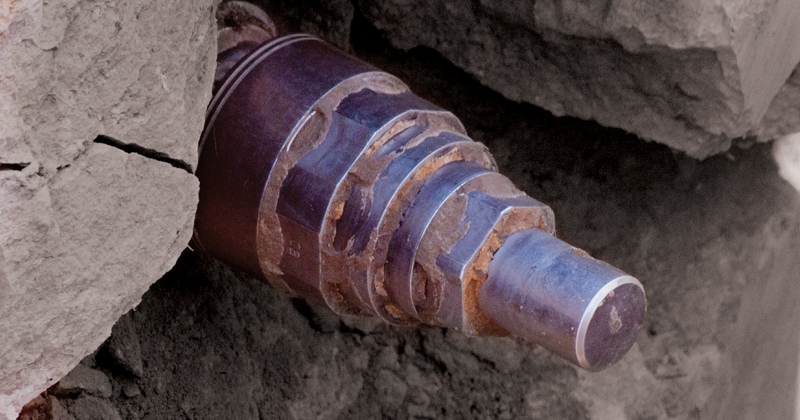 Once the bore is complete, American Communications Construction pulls through the cable-in-conduit, which is provided by Comcast. The cable-in-conduit helps minimizes future cut cables since the cable is encased in a PVC conduit. A 1.25-inch conduit is used for distribution and fiber-optic cable, while trunk lines are carried in a 1.5-inch conduit. Once the cable-in-conduit is in place, the crews make all necessary connections and test the line. Then the crew backfill the pits, use an air tamper to compact the soil back into each pit to minimize any potential sink holes, and put the sod back into place. American Communications Construction has been using the new Catamount™ piercing tools from HammerHead, and according to Parker these tools are helping to make their crews more efficient. According to Will LeBlanc, senior regional sales manager for HammerHead, the new tool design brings to the industry a reciprocating head that is easy to start, regardless of air pressure level, and is the first pneumatic piercing tool head that is effective in both hard conditions and soft soils and sand. Looking back, McBride is amazed at how fast his company has grown in only seven years. He’s also glad he made the decision to use piercing tools.